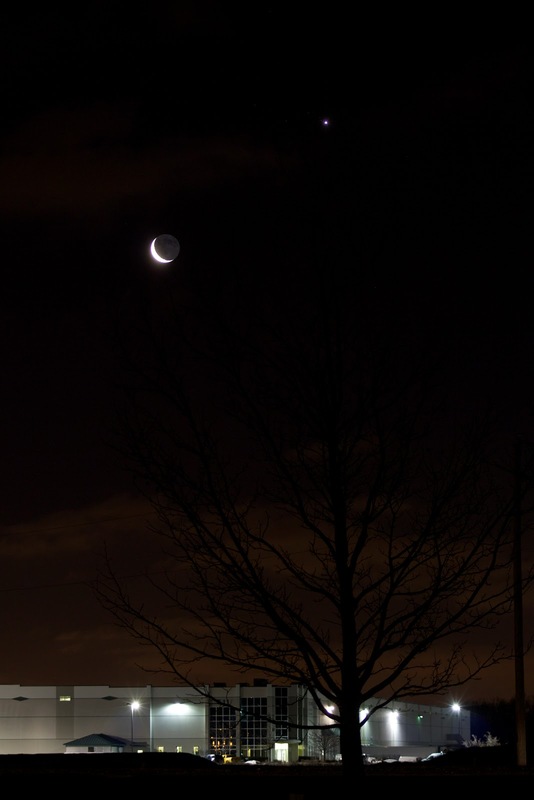 Earthshine on a crescent moon is probably my favorite thing ever, and my partner Chris knows this - that's why he called me at 6:00am on his way to work to tell me about the "crescent moon with earthshine a few feet away from the planet Venus." I swear he's learning so much just by listening to me ramble. I was super curious what he meant by "a few feet" so I decided to take Katie outside and check it out for myself. Boy was he right! 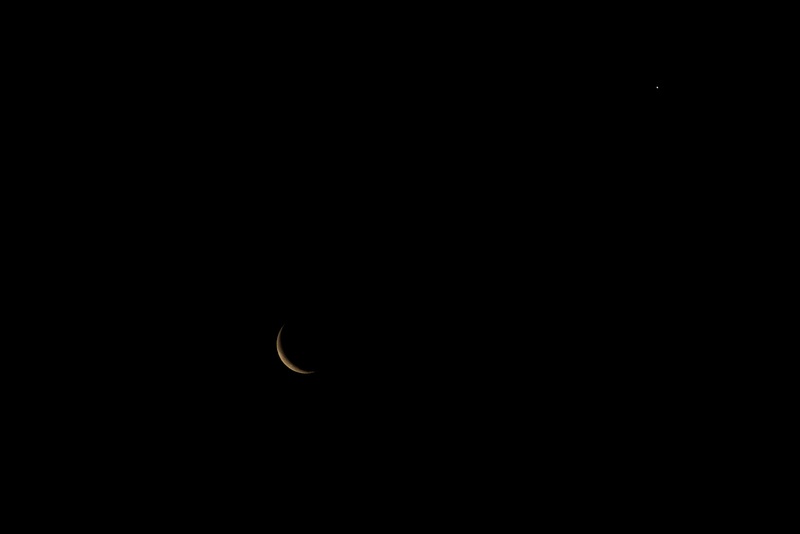 There, just above a tree, was the waning 12% crescent moon about 5° from Venus. I used my fist at arms length (which approximates 10°) and decided that it was about half that distance. 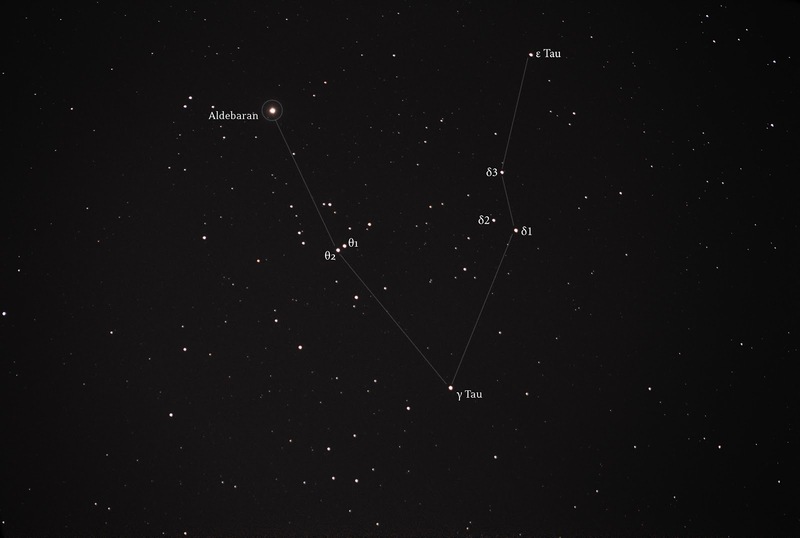 Looking it up on Stellarium, it's actually a bit closer, more like 4°39' separation. Very cool! If it weren't 7°F and windy, I would probably have stayed out to watch the full sunrise with Mercury peeking above the horizon just before the sun. 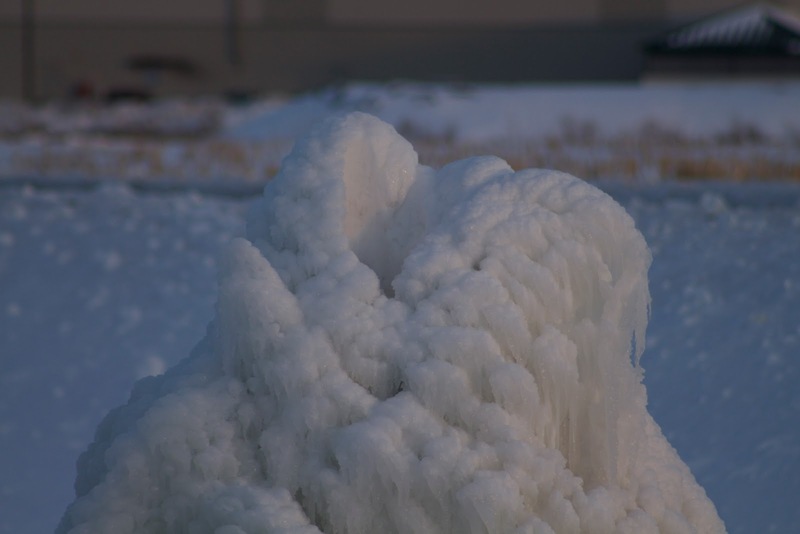 Because of the wind, I've learned to take a lot of frames each at the same settings. This lighter weight T5i camera is easy on the wrists for handheld shooting, but doesn't stay put in a breeze. 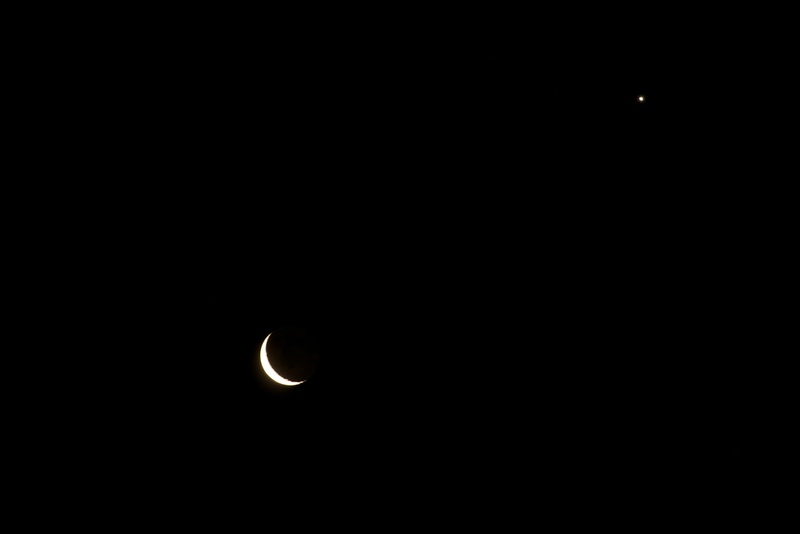 Here are some additional exposures of the conjunction. Went out at 4:50am "for the first time in forever" (still have the songs from the movie Frozen in my head) on February 21, 2013. 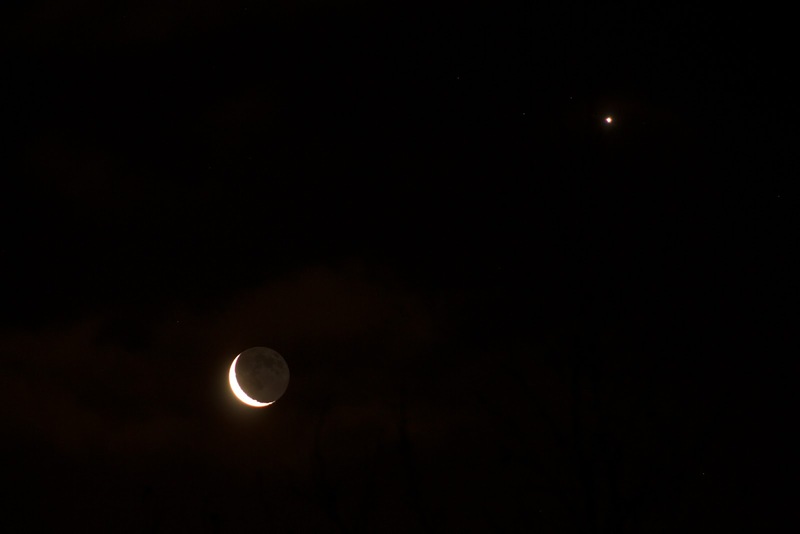 I saw the third quarter moon nestled between the brightest star(s) in Libra and the bright yellow planet Saturn. To the naked eye I could barely make out α Lib but I knew the moon should be right on top of it. 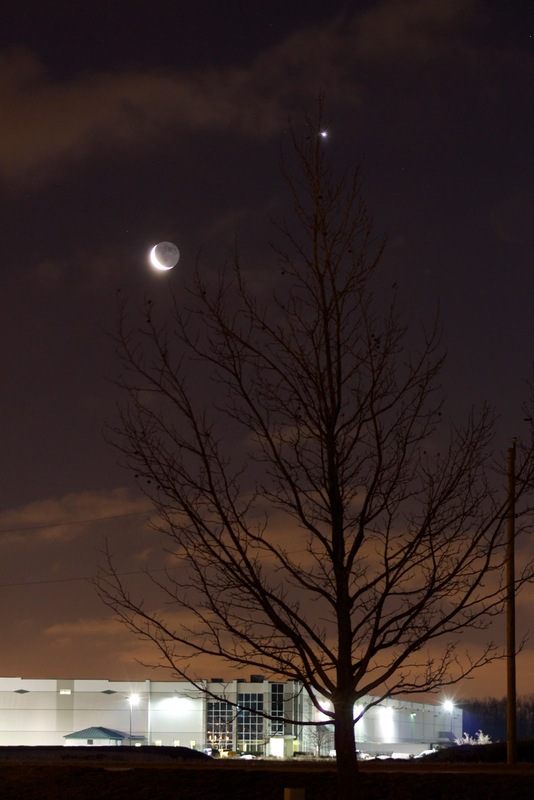 Sure enough, the moon was less than 2º from the pair of stars. 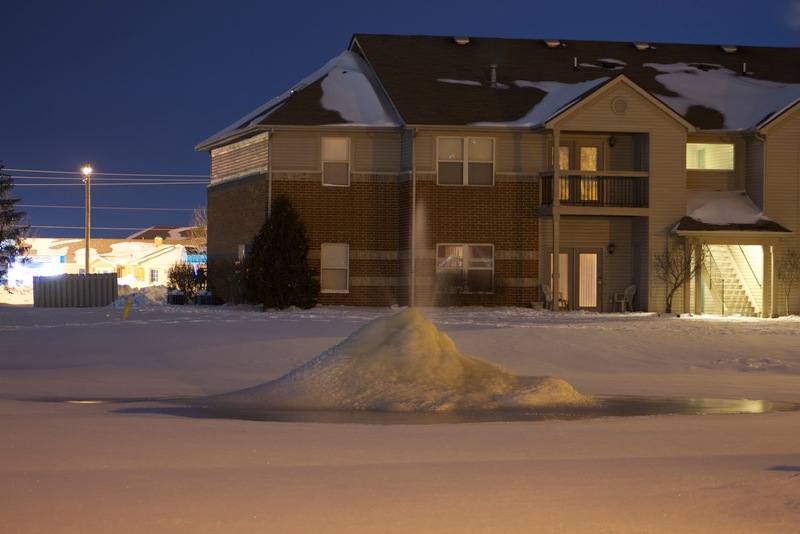 I was fascinated with a lump of ice forming around the fountain in our apartment complex pond. 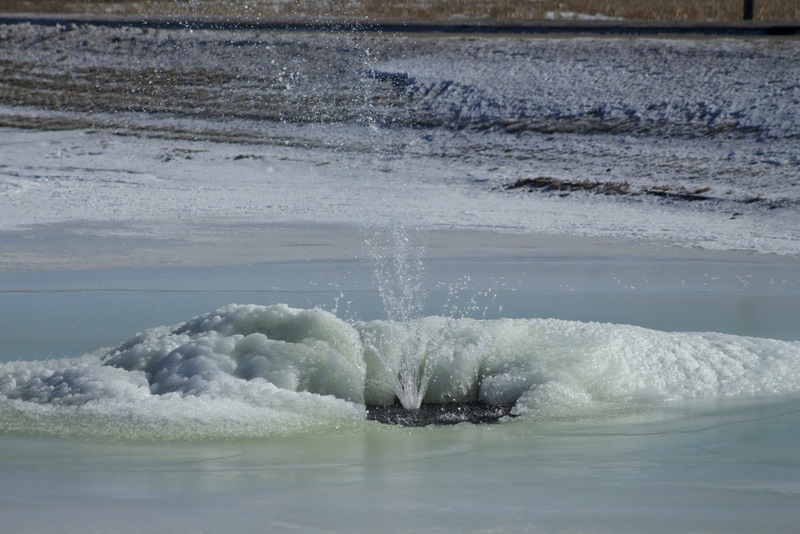 We've had an extremely cold winter, which gave this ice geyser (or ice volcano as I like to call it) plenty of time to form over several weeks. 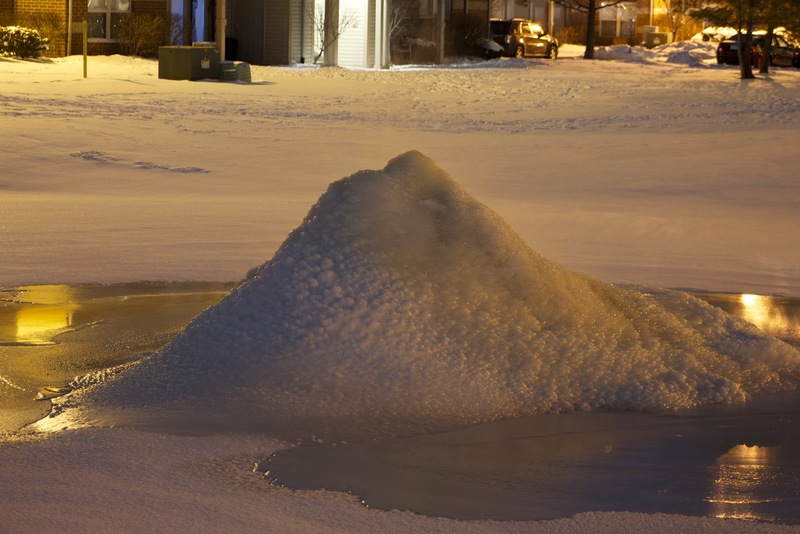 Joining the ranks of other icy solar system bodies, such as Saturn's moon Enceladus, Jupiter's moon Europa, and recently the dwarf planet Ceres - our apartment complex pond is in good company. 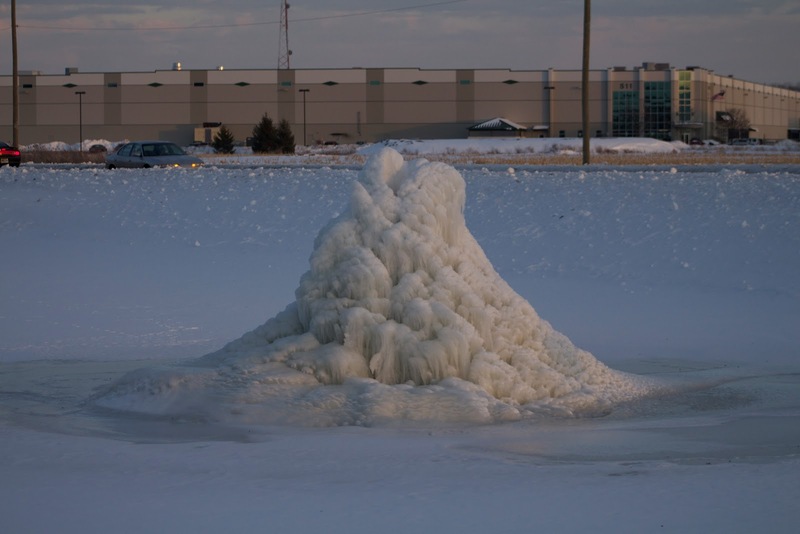 When they finally turned the fountain off, this is the peak ice volcano size! 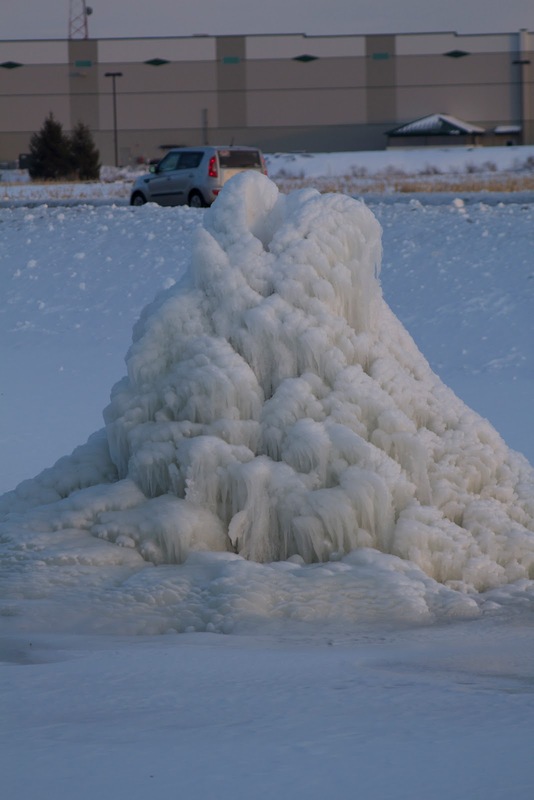 Here is a series of photos documenting the formation of the ice volcano, beginning on January 29, 2014 and ending when they finally turned the fountain off on February 13, 2014. It grew quickly in about 2 weeks total! 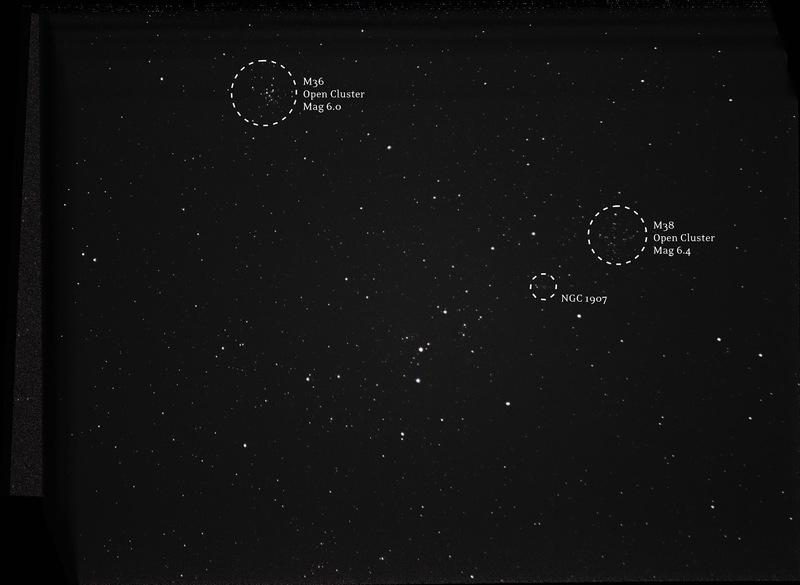 Phil Dimpelfeld from the Indiana Astronomical Society creates a Novice/Urban Observing List each month for newbies like myself with not-so-dark skies and not-so-powerful equipment. 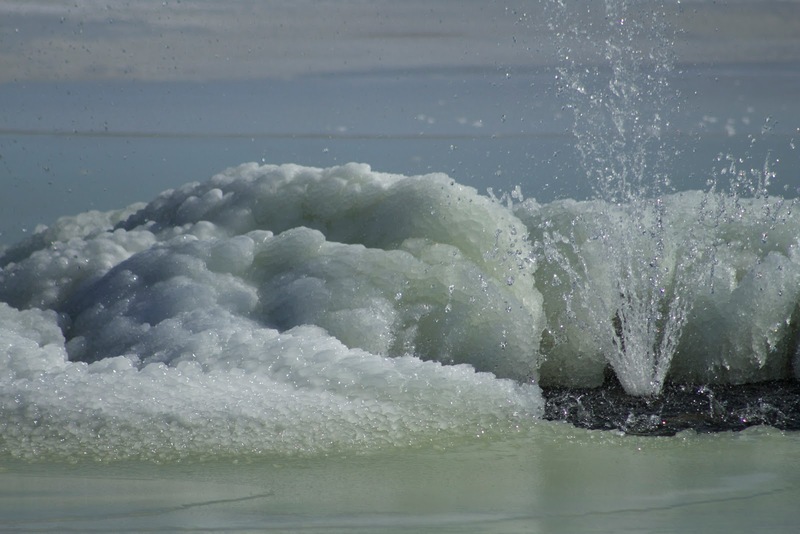 The January list included some very popular targets, a great incentive to get outside on some very VERY cold nights. 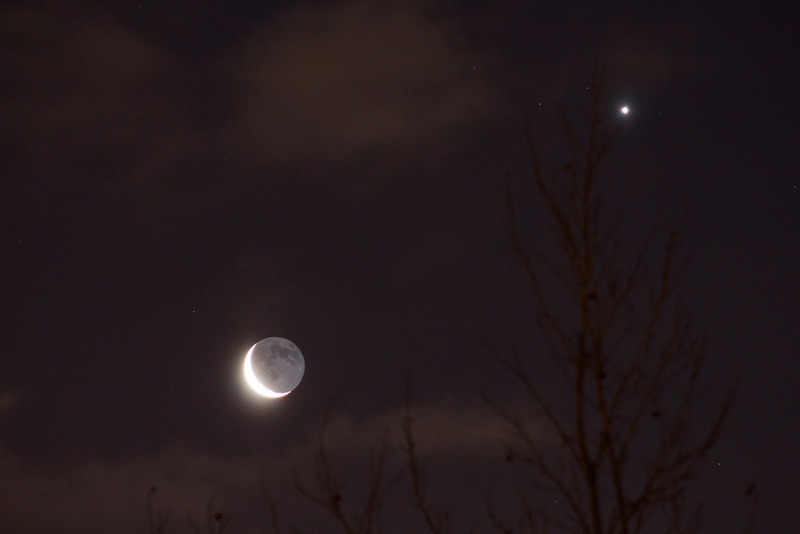 February looks like a good mix of objects, including the planet Jupiter, a few Messier clusters, lunar landmarks, and things I've never heard of before. We'll see how the weather holds. 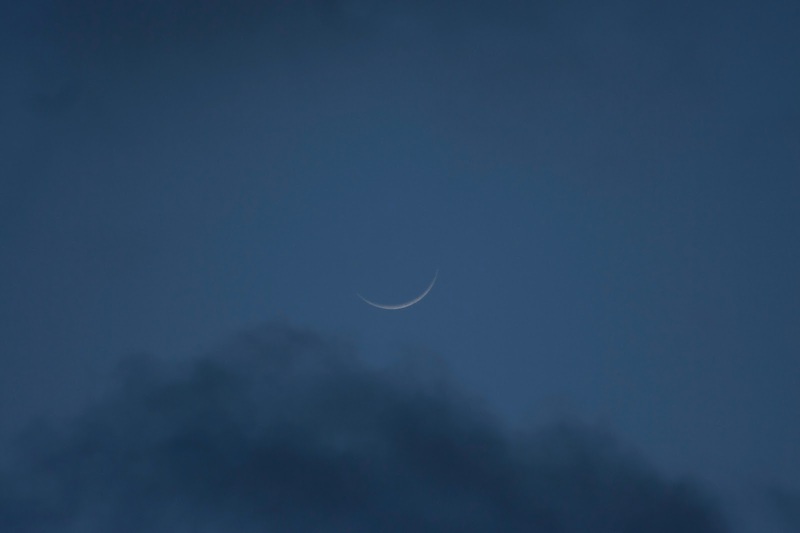 I've already missed the waxing quarter moon, and this month will be over before you know it! NGC 2392, the “Eskimo Nebula” (Caldwell 39), planetary nebula in Gemini, 07h 29.2m, +20° 55', mag = 9.2, size = 47" x 43". Note the bright central star. 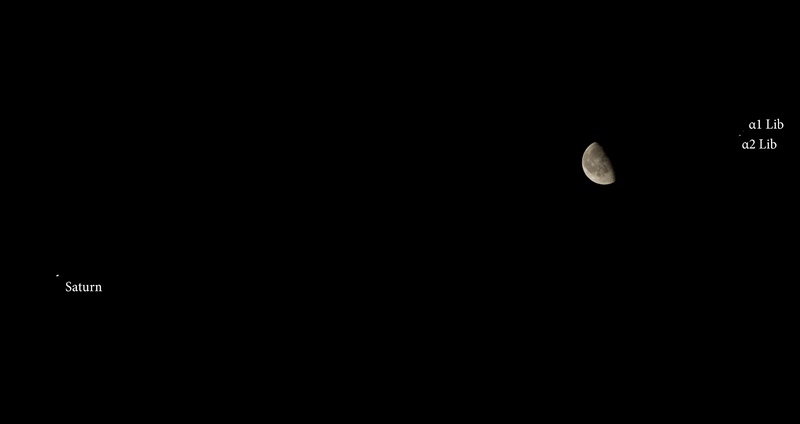 It's my slimmest moon photo yet at just 3% illumination! 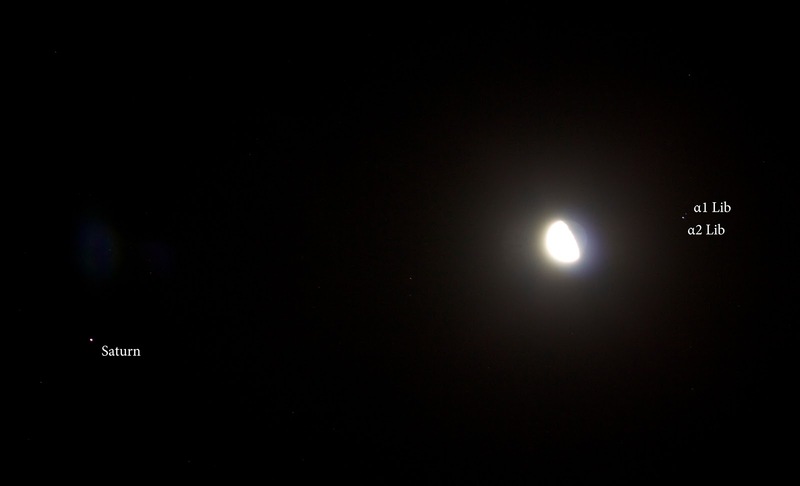 This beats out my previous slimmest moon of about 5% illumination. 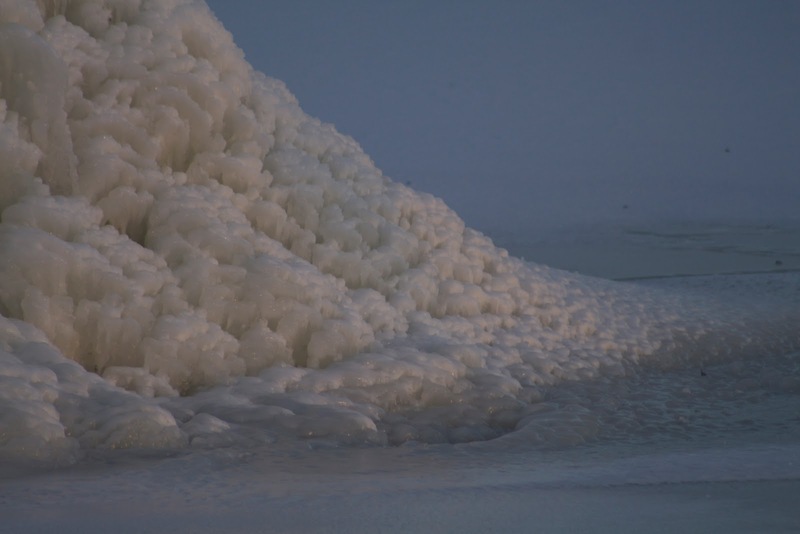 I took this photo at 7:48am on 1/29/2014 (now you can tell how late I am to getting around to blogging about it!). It was already more than 10° above the horizon by this point about 8 minutes before sunrise. It must have been quite the site earlier in a darker sky - a blazing bright thumbnail of light. 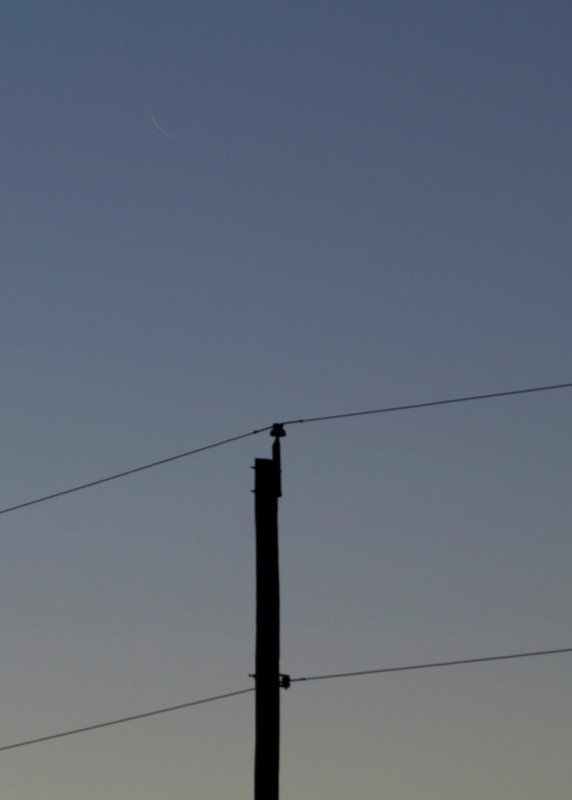 I believe my previous slimmest moon was photographed during the PanSTARRS comet observation, and it was about 5% illuminated. 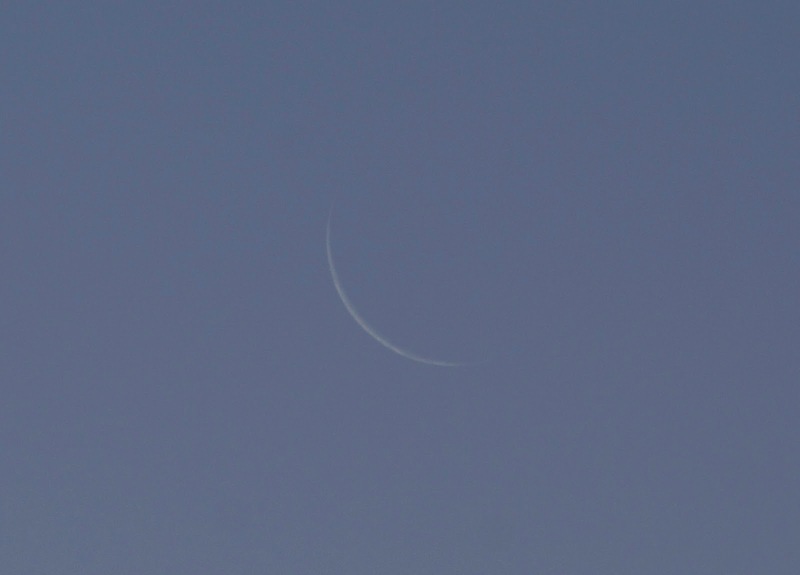 Earlier that morning it would have been at about 3% but since I observed it at dusk rather than dawn it was already slightly older. There were plenty of popular goodies on the January observing list - a good incentive to go outside on the coldest nights. 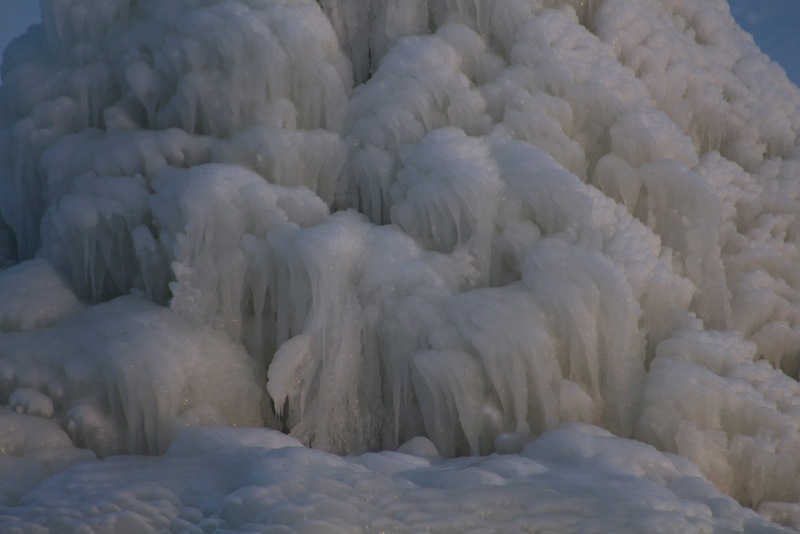 This month we had near record low temperatures down to the negative teens! Nevertheless, I was able to easily check some of these objects off my list. 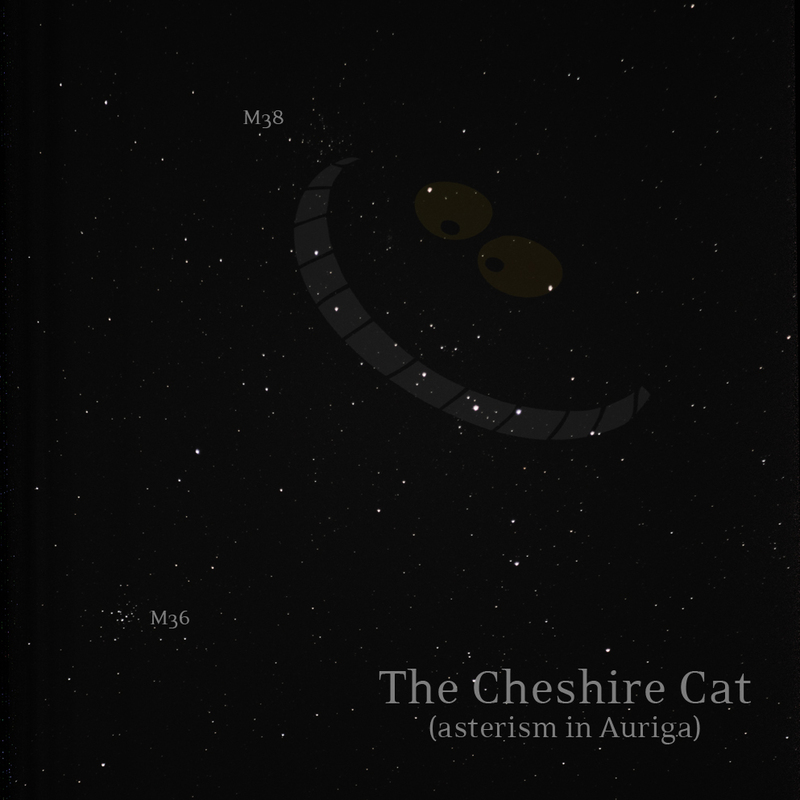 The Cheshire Cat was particularly fun, and I checked 4 objects off the list in Auriga. 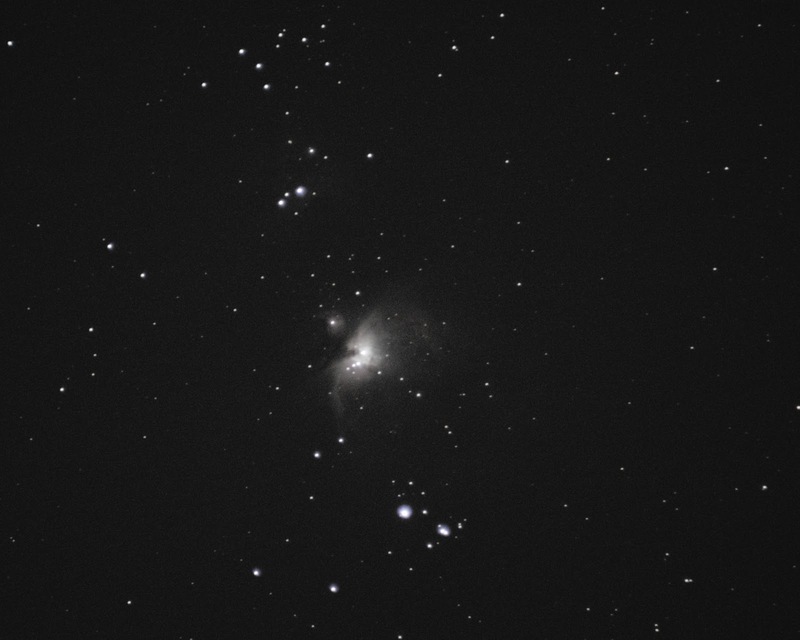 I did observe M42 during January, but I didn't get a very good photo of it, so I included my photo from December 30, 2013 to represent it on this post. 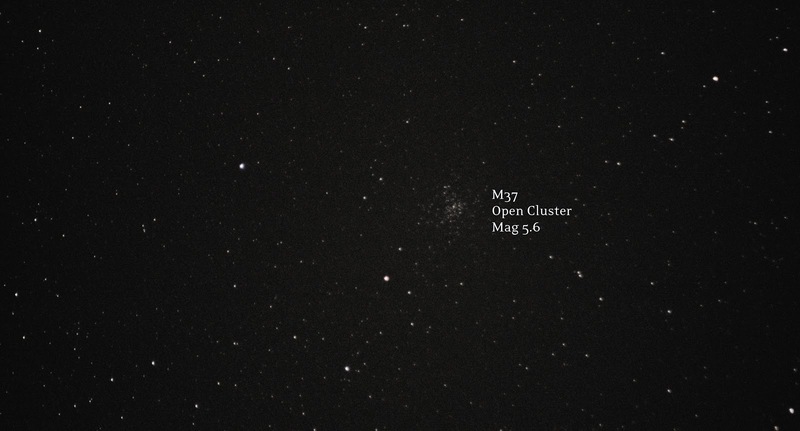 M37 was encouraging because it looks like my new camera will pick up globular clusters quite well. Finally, my new method of labeling lunar objects looks very clean and I'm happy with how they turned out. 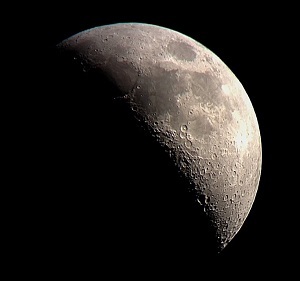 I also made some technical progress this month figuring out how to best photograph the moon with my T5i. 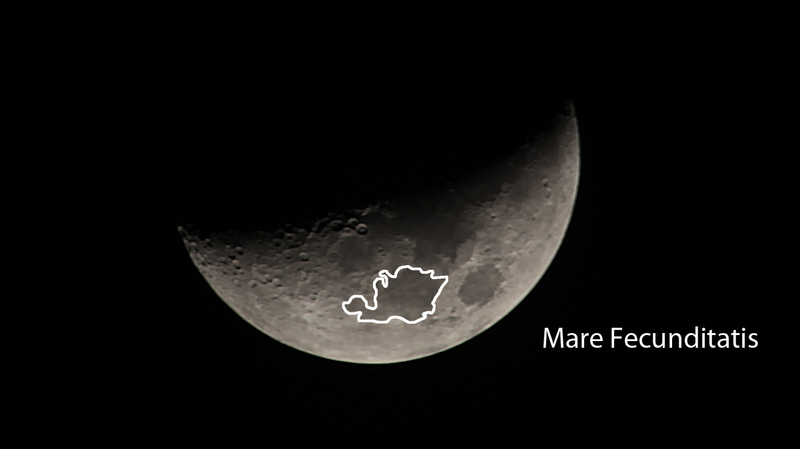 I'm closing out my January observing list with some lunar geography. 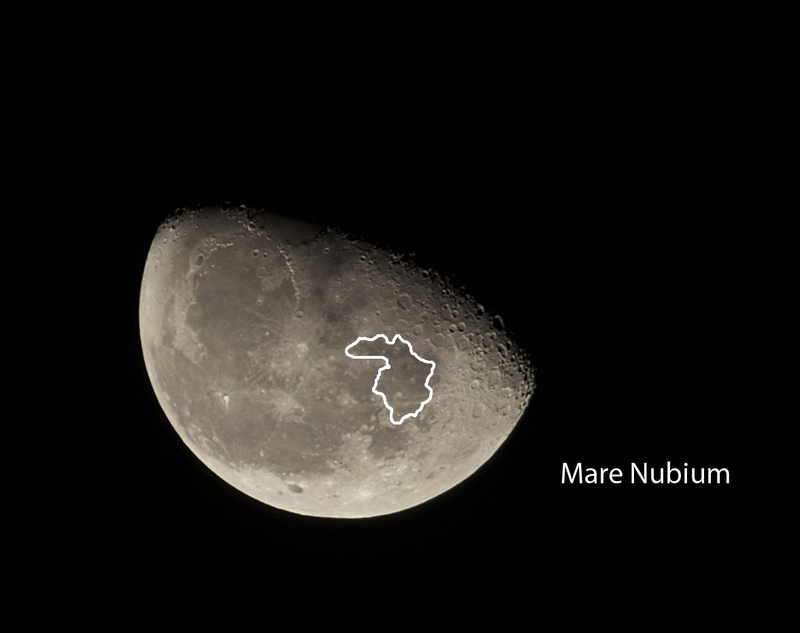 I had to look up Mare Nubium and Mare Fecunditatis online to know where they are - and then used moon photos that I took during the month to create my own labeled diagrams. These two features were much larger and easier to spot than some others on past observing lists.